Autonomous cars are the hot new thing in the auto industry, even though they're still probably years away from being anything near common on the roads. One issue? Two-thirds of people still don’t trust the cars to not run them over, and changing the rules of the road requires as much psychological research as it does technical research. People just aren’t really all that sure that autonomous cars recognize them, and right now the cars don't have a programmed response if you shout "I'm walking here!" as they almost run you over. A human driver, if they’re coming close to a pedestrian in the road, will usually either make eye contact with them, honk the horn, or shout obscenities (with or without gestures), all creating trust that the driver probably intends to stop for the walker. An autonomous car, though it was always aware of the pedestrian, stops and then cruises along in electric silence, without acknowledging the interaction. It passes the pedestrian, but the person had no reassurance that was going to happen, creating stress around encountering self-driving vehicles. 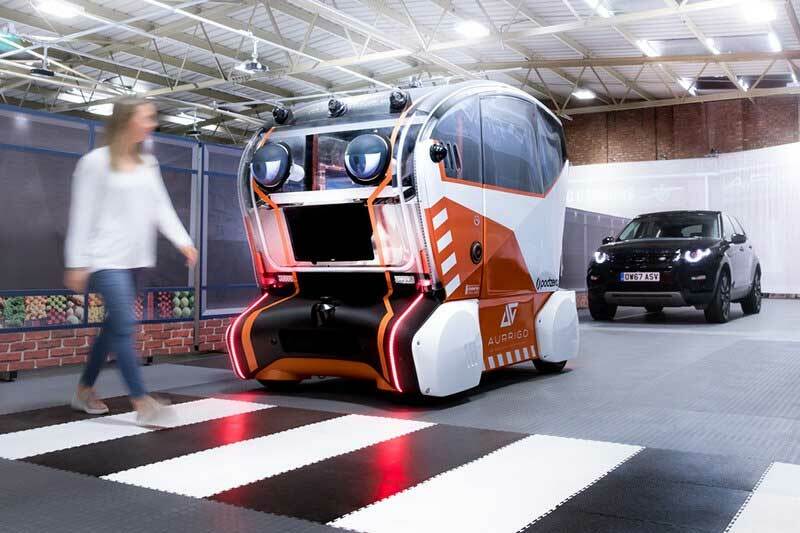 So, Jaguar Land Rover, as part of their continuing research into autonomy, have come up with a simple but relatable solution to this: a pair of human-like eyes on the front of an autonomous test vehicle which makes “eye contact” with pedestrians when it spots them. Though more of a research tool than a real-world solution, it's an interesting way to tackle the issue. The result is two displays on the front of the vehicle, about the size of headlights, which show a pair of eyes that dart back and forth across the road and looks at with pedestrians, complete with eyelids. It basically looks like what everyone’s idea of a humanized animated car was for years until Pixar came out with Cars and put the characters' eyes on the windshield instead. The idea is more to research human behavior than to create an actual future autonomous car feature. JLR will work with a team of cognitive psychologists to figure out how the eyes impact pedestrians' trust of the autonomous vehicles they're attached to, by holding focus group-style test interactions with and without them. The Internet has some mixed feelings on the eyes themselves. They are a bit...intense. However, I sincerely doubt we'll ever see these attached to the front of a Range Rover driving through town. As a research tool, they're certainly interesting, as the quest for autonomous vehicles looks to reinvent every part of how we interact with cars.